Guests will be able to input their preferences before checking in into their smart hotel rooms. Every detail will be customizable. 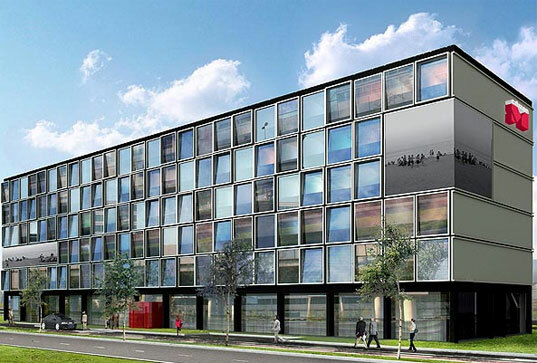 The “M” in Citizen M, a new hotel concept emerging in Amsterdam, stands for mobile. The startup is targeting adventurous travelers looking for quality digs but unwilling to pay for all the frills of luxury resorts—namely, huge rooms and valet services. But the M could also stand for modern, since the look and feel (still conceptual, since the first hotel has yet to open) will be very modern, geared toward tech-savvy travelers. The hotel startup plans to open its first location—at Schiphol Airport in Amsterdam—by the end of March 2008, followed by more hotels across Europe. The hotels are being built with pod-like rooms that are prefabricated off site and then, literally, plugged into the main hotel structure like Lego pieces. The rooms are currently being fabricated at a factory in Amsterdam, and RFID technology will play a vital role in the hotel’s operations. A guest’s experience with the hotel will begin with an online reservation service, explains Philips Applied Technologies’ integral project manager, Peter Boon. During registration, the visitor will be asked the nature of the trip (business, vacation or a romantic getaway), as well as preferences regarding lighting, music and temperature. These preferences will then be saved in a profile linked to that particular customer. Upon arrival at the hotel, the guest will walk up to a computer kiosk, call up the reservation and pick up an RFID card from a basket next to the kiosk. The reservation software will instruct the individual to hold the card up to an interrogator embedded in the kiosk. This will enable the software to access the unique ID encoded to the NXP Semiconductors Mifare Ultralight high-frequency (HF) 13.56 MHz passive RFID inlay embedded in the card, and associate that number with the guest’s reservation information and preferences. As soon as check-in is complete, the hotel’s reservation database will send a message to the facility’s centrally located main heating and cooling system, which will begin adjusting the room to the guest’s desired temperature. The visitor will then unlock the room’s door by holding the RFID card up to a reader mounted near the door handle. The reader will transmit a message to the room’s main controller—a PC built into one wall—which will immediately set the room’s lighting to the guest’s desired brightness and hue (using filters to cast colored light), and also queue the audio and visual devices in the room to match the guest’s profile. “For a guest from the United States, for example, all of the U.S.-based channels that the hotel receives will appear first,” Boon explains. The temperature and audio-visual components inside each room—the lighting, thermostat, music player and television—will all be assigned IP addresses so that the guest can control them wirelessly, via Wi-Fi, either through the room’s central controller or with a large Wi-Fi-enabled handheld controller that Citizen M has dubbed a “moodpad.” The telephone in each room will employ voice-over IP technology, as well. In addition to adjusting the room’s temperature, sounds and lighting, guests will also use the moodpad to schedule a wake-up service—but these won’t be your run-of-the-mill wakeup calls, and they won’t necessarily involve a telephone. “You might choose to have soft lights and chiming noises wake you up, or you could set the TV to turn on and yell at you like a drill sergeant,” jokes Boon. What’s more, housekeeping staff will be able to use RFID cards to enter the guest rooms as well. When a room’s RFID interrogator reads a housekeeper’s card ID, the controller will send a message to the main hotel-management software that the room is being cleaned, enabling hotel management to keep tabs on status and turn-around time. Guests checking out will return to the lobby kiosks and present their RFID cards to the reader, and the software will guide them through the checkout process. They will then be able to keep the cards to use at subsequent visits to the same or different Citizen M locations. Philips expects to be able to apply this concept (of building out structures using prefabricated rooms with built-in Wi-Fi-based controlling infrastructures) not just for hotels but also for general office buildings, hospitals or nursing homes. The company calls the system One Star Is Born, and claims it will save hotels or other building managers money through operational efficiency, since they will be able to maintain building systems centrally, and from a remote location.